Produktinformationen "One Punch Man - Genos Statue - HQS: Tsume"
Trotz der versandkostenfreien Lieferung ab 150,-€ müssen wir u.U. in dem Fall Genos HQS von Tsume Versandkosten berechnen, da es sich u.U. bei den Abmaßen um ein Sperrgut handelt. Die genauen Kosten können jedoch erst nach Ankunft der Ware bei uns ermittelt werden. Für Lieferungen in das Ausland müssen wir gesonderte Anfragen starten, wenn wir die Statue schlussendlich auf Lager haben und die genauen Daten wie Abmasse und Gewicht mit Versandverpackung haben. Die berechnung der Versandkosten für Lieferungen [in das Ausland] können leider auch erst nach Ankunft der Statue bei uns im Lager bestimmt werden, bitte die Tatsache berücksichtigen! Produktbeschreibung in englisch: Limited edition only 1800 pieces worldwide. Genos HQS By Tsume, from One Punch Man. 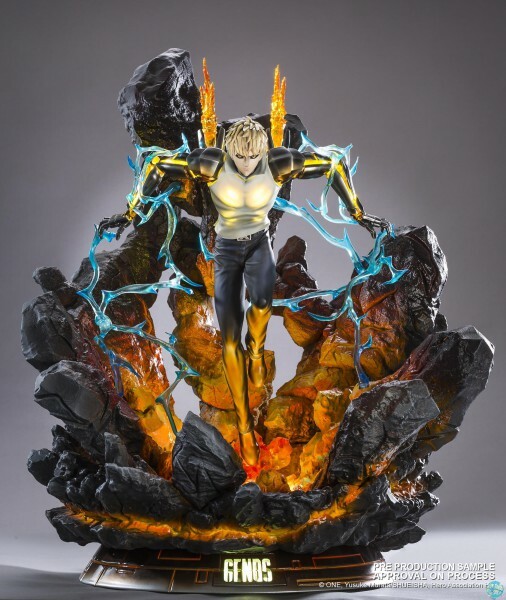 Included one Genos statue, the base with rocks, blue lightning effects, its metal plate and an authenticity certificate. Includes a LED lighting system in the base. One Punch Man being one of the main events of the Tsume Fan Days 4, Tsume introduced its first HQS by Tsume statue from this brilliant show as well. It’s the charismatic disciple of the hero who was chosen this time, the demon cyborg Genos, setup in an amazing statue coming with a complex LED lighting system! Genos is a powerful cyborg who quickly reached the S rank of the Hero Association. The statue we created of him is dedicated to its outstanding fighting skills. Flying out of a lava crater, Genos is about to go all out. His arms’ mechanical parts are very detailed and mix clear resin and standard resin with metallic paint effects. The setup allows the character to float over the scene instead of being merely standing. Finally, our exclusive programmable LED lighting system adds more realism to the statue. Combined with the overall paint job, it creates a unique atmosphere and a great piece of art! Weiterführende Links zu "One Punch Man - Genos Statue - HQS: Tsume"
Kundenbewertungen für "One Punch Man - Genos Statue - HQS: Tsume"